What do you do if you’ve got a fully equipped machine shop and you’re tired of taking old beer cans to the recycler? If you’re like [Brock], you’ll probably end up melting those cans down to build an engine. After gathering 50 pounds of beer cans and melting them down into ingots of various sizes, [Brock] and company had a lot of aluminum and nothing to build. Eventually, someone got the idea to build an internal combustion engine out of these beer can ingots. So far, the beer can engine crew has built two engines from these beer can ingots. The four-stroke engine started off as a 5-inch aluminum cube, bored and milled into something resembling an engine block. When [Brock] and the beer can engine team completed their four-stroke masterpiece, they had a water-cooled engine displacing 150cc with a single 2″ bore piston. 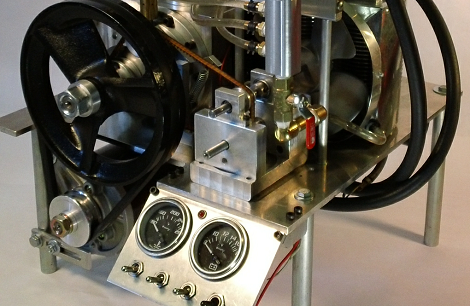 The two-stroke engine is a much simpler affair with a 1 inch bore displacing 19cc. Even though there’s no information at all covering the pottery kiln foundry used to melt the beer cans into ingots, it’s an amazing piece of work building and engine from the ground up. You can check out a few videos of both engines after the break. I like that he used his mill table and strapping to hold the engine down for testing, haha. There are real problems w/ both the alloy used for cans and the tendency for the can coatings to produce porous castings. I can’t think of a single book on aluminum casting that doesn’t warn the reader NOT to use cans. Good for you, you’ve successfully demonstrated how much smarter you are than the person who made this engine. Now piss off unless you have something positive to say. It’s very hard to project tone on the internet. As a result, you might be overreacting to what Reg said – I didn’t see this as a slam on the project, but maybe my skin is thicker. The guy was stating a succinct fact, which is that beer can aluminum is perhaps more suitable for use in making heavy duty condoms than for casting engine blocks. I send out my castings (I don’t even mill many parts anymore), but I have often wondered about melting down pop and beer cans to make a small engine. I’m amazed at the quality of this work. It’s getting hard to even find old pistons to melt down… so color me impressed! There is always someone who is ready to ruin a clever project. Book knowledge is exactly that, he is only parroting what someone else said. I bet he never tried it. I intend to something similar to this myself, using melted down beer and soft drink cans to cast my pistons and cylinder barrels, I’ll probably machine the crankcase out of a bought piece of solid aluminium. The can itself is made of 3104-H19 or 3004-H19 aluminum alloy, while the poptop and lid are probably 5182. The “H” in the alloy code has to do with the heat treatment state the alloy is in prior to working, additional work or time or heat will change the state as the alloy continues to harden. The lid and poptop are closer to the type of work I did, those I know I could design replacement dies for those without even seeing what they currently use, all I’d need is a part drawing. And, the books are right, Reg. Beer can aluminum is very gummy (it galls to the tools) and you never know when you’re going to hit a void. But, we started doing it before we read the books. So, we found some tricks like using Morton’s Light salt as a flux and pouring as cold as we can to try and cut down on some of the porosity. We certainly won’t be taking on Alcoa any time soon, or building airplanes out of it, but for things like these engines whose entire mission in life is to turn gas into noise it’s a material worth using just for the novelty. Thats interesting, I remember in a lecture on materials at university that the top half od the can and the bottom half of the can are made of 2 quite different aloys to serve different functions. The bottom alloy is extreamly ductile which allows the long can shape with thin walls to be forged from a cube shaped billet in a single pressing! The top half is made of an alloy which tares easily so that the ring pull works (otherwise you wouldnt be able to open the can). If i remmeber correctly once melted down you could only make the ductile aloy again from the smelt due to the compersition of the top alloy requiring a lower proportion of some eliment manganease or something. The whole trick was about playing around with prisipitation in the aluminium to allow or prevent the travle of dislocations in the metal. Cool stuff! I worked as a finishing manager at an Alcoa plant for 7 years that manufactured can stock for the canning companies. The Tabs are made of a hard and strong (not brittle) alloys (various alloys depending on the the customers) so they won’t break when you pop the top. The tops are made from alloys that are hard but brittle so when etched they pop open correctly. The can body is usually a 3xxx series that is very drawable. One of the reasons charities collect tabs from cans instead of whole cans is because it is a much more useful alloy for recycling. I’m sure they probably get a more per lb. Alcoa takes whole cans, melts them down and re-alloys them by “cutting” the magnesium and manganese down using pure un-alloyed aluminum. Of course they have spectrometers to tell what they have, alloy wise, in the furnace. Basically my suggestion for using cans is to try to find a source for some pure aluminum ingot and cut the mag. and mang down to manageable levels. If you know basically the percentages of the alloy you have verse what you want (should be able to find them online somewhere) you can figure out how much pure alloy aluminum to weight of can alloy and if it needs iron or other adds for the alloy you want. Should get you pretty close to something usable. Just like baking a cake that you dumped too much of the first ingredient into and need to now make a bigger batch to get the ratio back in wack. I wish I remembered the lubricant we used for the stamping we did. Nice stuff, kept the aluminum from galling up on the punches. Very thin, thinner than kerosene. Might have been Cindol 3411 or Cindol 4612. Not exactly stuff you could run down to the hardware store and get though. @ Richard. The choice of alloy for the bottom also has to do with how much the aluminum would work harden. A draw die has to have multiple stations where the metal is drawn into thinner sections each closer to the end shape. Work hardening would be trouble and then you would have to put a induction heater inline to anneal the material. Very messy if you didn’t plan for it ahead of time. ;-) Yes I made that mistake once on a die for a client. We changed the way we did the forming rather than cut up the die and add a induction heater. The ideal alloy for the top, would conversely be one that work hardens, you want it to spring and also to shear. Love it! Looks really cool, and it apparently actually works. I guess that’s the difference between the guy(s) who made this engine and nay-sayers like Reg who can only tell people about why what they want to do can’t be done, isn’t it? Thank you SFRH. For the record, the shop and tools belong to my friend Ace. I’m just lucky enough to have a friend to drink beer with and tackle fun projects on his machines. We tried different methods, but the best/easiest we’ve found is to just toss the crushed cans into the pot. The paint burns off and the aluminum drains out of a “shell” of plastic or teflon or whatever they use to coat the cans. After about 10 minutes, we scrape the dross and those shells off to the side of the pot and press it with a flat bar to squeeze any remaining metal into the pot. While the kiln lid’s open, we toss in more cans. Then, 10 minutes later, we fish out what was squeezed up against the side of the pot and toss it in a coffee can next to the kiln. Lather, rinse, repeat until the pot’s full. … hey ace, lets build a plane! Oh OK Brock, I’ll get the beer! As interesting as this is, it would have been far out to read/hear that they used the Dave Gingery books series to build the machine tools they used to build this engine. Pretty much exactly what I’ve been meaning to do. One thing I did find, and other places I’ve read, was that due to the thin nature of drink cans and the temps need to melt them, unless you drop them into an already melted pool of metal, they tend to just burn. Then you just end up with a heap of slag on top. One raw material I’ve found good is old HDD chassis. Smash them up with and axe into smaller pieces and they melt down quite quickly. And I only use a dog food can in my house fire to melt it. That’s exactly what I found. Get a nice puddle going with some real alu then dunk the can underneath. Before that I just had a heap of crushed can husks in the crucible. Great work! Keep making beautiful creations of mechanical engineering inspiration! Excellent. Apparently the aluminum used by Trick Flow on their Twisted Wedge heads was gummy to machine.